No one disputes the officials blew the call. The question is whether the NFL rulebook calls for a remedy. In the legal equivalent of a Hail Mary pass, two New Orleans Saints season ticket-holders asked a judge on Tuesday to order the NFL commissioner to reverse the results of the NFC Championship game that sent the Los Angeles Rams to the Super Bowl, or schedule a do-over. Their lawsuit, filed in state court, says Roger Goodell should enforce a league rule governing ‘‘extraordinarily unfair acts.’’ Remedies include reversal of a game’s result or the rescheduling of a game — in its entirety or from the point when the act occurred. At issue is the failure of officials to call pass interference or roughness penalties when Rams cornerback Nickell Robey-Coleman leveled Saints receiver Tommylee Lewis late in the fourth quarter of Sunday’s game. A hearing is tentatively set for Monday. In a related development, two sources with knowledge of the NFL’s plans said on Tuesday that the league’s competition committee will consider expanding replay reviews to include certain penalties, including pass interference. ‘‘Why is the rule there if it’s not going to be implemented?’’ asked attorney Frank D'Amico, who filed the suit in state Civil District Court in New Orleans on behalf of Tommy Badeaux and Candis Lambert. 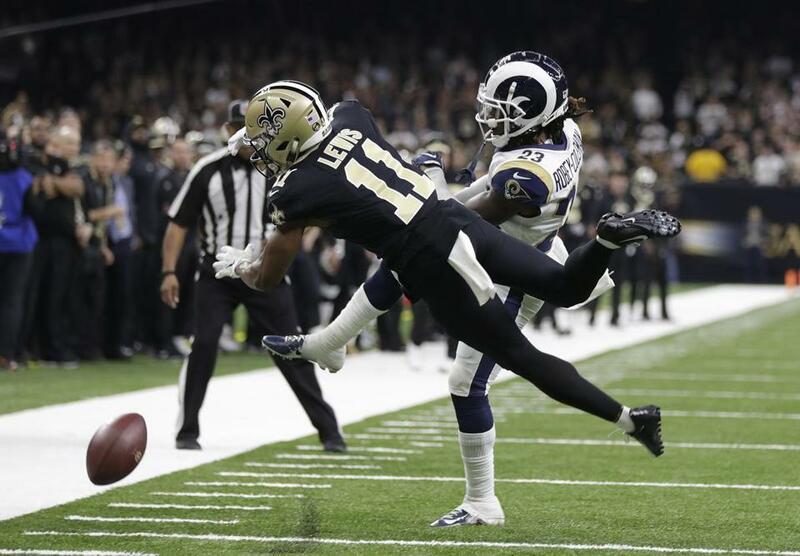 No penalty was called after the Rams’ Nickell Robey-Coleman hit Saints receiver Tommylee Lewis while a pass was in the air with less than two minutes to go in regulation on Sunday. A flag would have meant a first down for the Saints, who could have then run down the clock and won the game with a field goal. Instead, the Saints had to kick their go-ahead field goal with 1:41 left. That gave the Rams time to come back and tie the with a field goal at the end of regulation, before they went on to win in overtime. The question is whether an officiating mistake — even an egregious one — is the type of ‘‘club action, non-participant interference, or calamity’’ that merits the remedy D'Amico’s clients seek. In a related development, two people with direct knowledge of the NFL’s plans said on Tuesday that the league’s competition committee will consider expanding replay reviews to include certain penalties, including pass interference. A former Sacramento Kings executive has pleaded guilty to siphoning $13.4 million from the team, court records show. The records show former chief revenue officer Jeffrey David pleaded guilty Tuesday to federal charges of wire fraud and identity theft. He faces 10 years in prison when he is sentenced April 15. David was charged last year with forging the team president’s signature to divert sponsorship payments to a bank account he controlled . . . The Rockets and Bulls finalized a trade that sent Carmelo Anthony from Houston to Chicago. The Bulls acquired the draft rights to Jon Diebler and cash considerations in exchange for the rights to Tadija Dragicevic. Former University of Arizona assistant coach Emanuel ‘‘Book’’ Richardson on Tuesday became the latest person to plead guilty in a federal prosecution that exposed corruption in college basketball recruiting. Richardson, 46, admitted he accepted $20,000 in 2017 in exchange for a promise to steer student athletes potentially headed to the NBA to an aspiring business manager, Christian Dawkins. Prosecutors said Richardson planned to use $15,000 of the money to entice one prized recruit to attend Arizona. Richardson was among 10 college basketball figures arrested in September 2017 in a scandal that exposed a network of personal managers and advisers who paid bribes to coaches and parents of highly touted recruits to steer top athletes to schools. Christen Press scored in the 53rd minute and the US national team rebounded from a rare loss with a 1-0 win over Spain in Alicante on Tuesday. The United States was coming off a 3-1 loss to France that snapped a 28-match unbeaten streak. The match was the second of a 10-match series ahead of the World Cup . . . Colorado Rapids and former US national team goalkeeper Tim Howard said this season will be his last in Major League Soccer. Howard made 121 appearances with the national team, including World Cup tournaments in 2010 and 2014. He holds US men’s team record for most wins, with 62 . . . Ron Burkle has become the new lead investor in the Sacramento Republic soccer team. Sacramento is among the contenders for an expansion franchise, along with St. Louis, Phoenix, and Detroit . . . The search for the missing plane taking Argentine soccer player Emiliano Sala to his new team in Wales was called off Tuesday with authorities not expecting to find any survivors. Sala’s plane disappeared Monday night off the coast of Guernsey as it made the journey from Nantes. Sala had signed with Cardiff for a club-record fee last week. The Braves agreed Tuesday to one-year contract to bring back All-Star outfielder Nick Markakis, who took a significant pay cut coming off one of the best seasons of his career. The deal is worth a guaranteed $6 million and includes a club option for 2020. Markakis became a free agent after completing a $44 million, four-year deal that he signed with the Braves for the 2015 season. In another sign of the dwindling demand for veteran free agents, Markakis generated little interest on the open market and settled for a $4 million salary this season. The World Anti-Doping Agency’s executive committee declined to punish Russia’s anti-doping watchdog even though the Russian organization missed an end-of-year deadline to hand over data on 10,000 suspicious doping samples. The world agency’s investigators were eventually allowed into the lab in Moscow that held the data, and they reported they had obtained all of it.